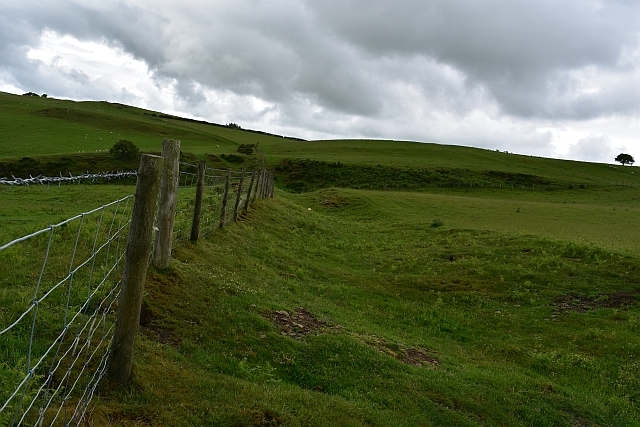 Offa’s Dyke is an extraordinary Anglo-Saxon earthwork structure that runs through the English-Welsh borderlands. Built in the late eighth century by Offa, the king of Mercia, it is a ditch and bank system which may have been used as a defence or just as a way to mark the boundary between Mercia and Wales. 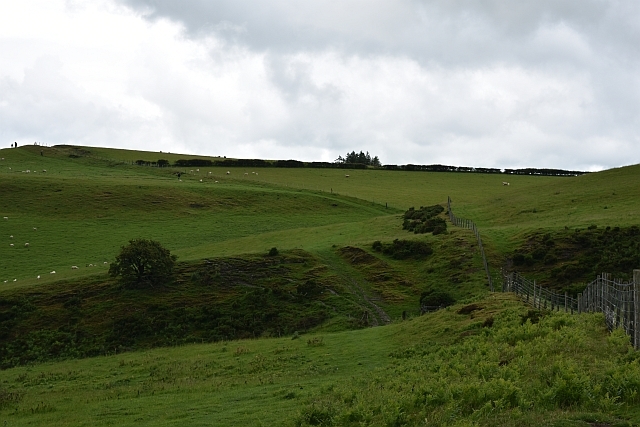 Those supporting the idea that the dyke was a defensive structure, usually point to the fact that the dyke consisted of a ditch on the Welsh side and a bank on the English side, which would have given the English good views across into Wales. 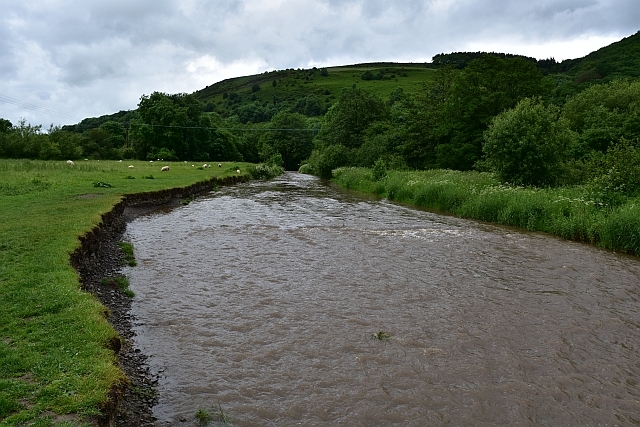 It is believed that the original dyke was around 18 metres wide, with an 8 metre height difference between the bottom of the ditch and the top of the bank. It is also possible that the top of the bank was crowned with a wooden palisade. Offa’s Dyke is surrounded by plenty of mystery that historians and archaeologists are still trying to unravel. For starters, how long is the dyke? Some say it goes from coast to coast. For example, Asser, a monk recruited by King Alfred the Great to write his biography around the late 890’s wrote “a certain vigorous King called Offa had a great dyke built between Wales and Mercia from sea to sea.” However, the evidence suggests that the dyke did not go from sea to sea. Some say it starts in Herefordshire near the town of Kington and travels northwards and stops 5 miles before the coast. This would make the dyke around 65 miles long. English Heritage claim to look after a 3 mile stretch that is just north of Chepstow, and south of Herefordshire, so its confusing how it fits together. Was there a gap in Herefordshire ? Over time, the weather and our management of the land have damaged the dyke, and in some places it has completely disappeared. What is left makes the visitor wonder how this monument was built in a time we call ‘the dark ages’. Those involved in its construction would have been out in all weather in the remote wilds using only hand tools to dig the ditch and build the bank. There must also have been some degree of forward planning in order avoid or use any geographical obstacles. In its day it must have been a real achievement and quite off-putting for the Welsh. In early Anglo-Saxon times, England wasn’t a unified country ruled over by a single king. Instead, the country was broken into a number of smaller kingdoms. Between 757 and 796, Offa ruled the kingdom of Mercia, an area that roughly equates with today's Midlands. He was based near Tamworth, but his territory extended from the border with Wales up to the River Mersey, across to the fens, and down to the Thames Valley. He also gained control over Kent, East Anglia, and Lincolnshire during his reign. With two of his daughters married to the kings of Wessex and Northumberland, he was politically very strong and some have even suggested he was the first de facto King of England. The borderland between England and Wales, often called the Welsh Marches, was a troublesome territory to defend even then. During his reign, Offa frequently battled the Welsh. To enforce his power and to control Welsh incursions into his territory he built his dyke, one of the most outstanding structures in Britain. We chose to explore Offa’s Dyke from the border town of Knighton or Tref-y-Clawdd if you're speaking Welsh, which means town of the dyke. 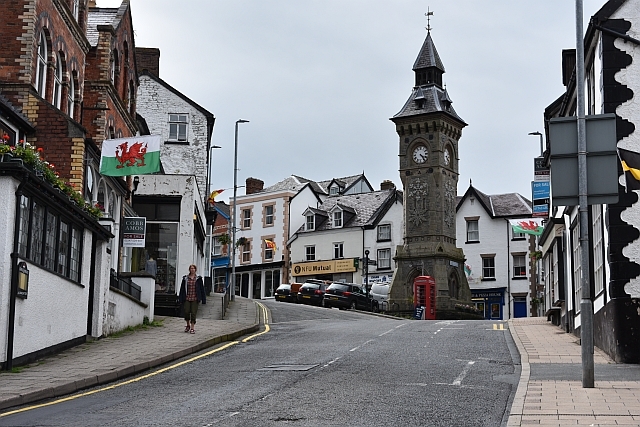 The town sits mostly in Wales, but a small part is in the English county of Shropshire. We visited during the European Football Championships, so there were plenty of national flags flying! 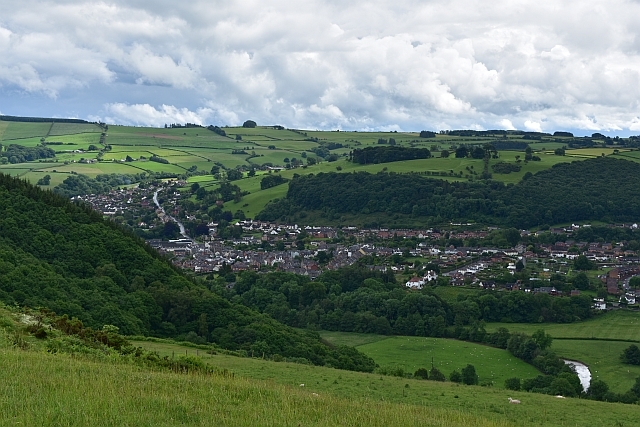 Knighton is the only town or village along Offa’s Dyke, and is the half-way point in the near 180-mile-long Offa’s Dyke Path, a long distance footpath. To celebrate these facts the town has built the Offa’s Dyke Centre, which is a good place to start if you wish to understand the history of the dyke and the skill and effort required to build it. If you follow the town trail, you will come across many interesting houses and buildings, and even get a glimpse of the dyke within the town. Our Shropshire holiday was a bit damp around the edges, but when we visited Knighton, the sun decided to come out, which gave us a chance to view the dyke up in the hills without getting soaked in the process. 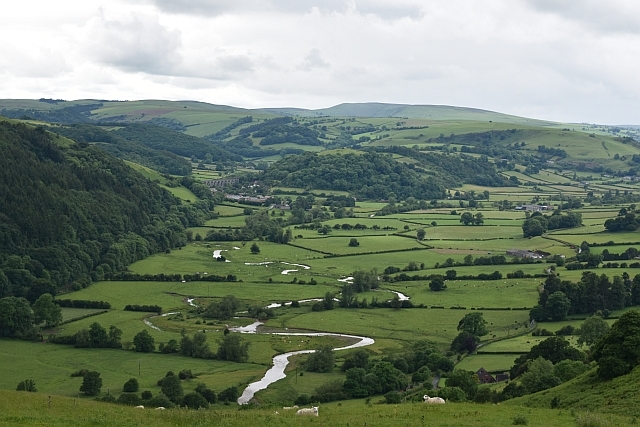 Our walk took us along the River Teme and up onto the hilltop of Panpunton, following the Offa’s Dyke Path. The climb was steep, but the views of the surrounding countryside were stunning. It really made you aware of the effort the dyke's builders made around 1200 years ago. Somehow they managed to build the dyke and take it up and down the hills through this dramatic landscape for mile after mile. Impressive! There are many points along Offa’s Dyke that can be visited. It is wise to plan where to go and see it. Obviously, if you’re really keen you can walk the long distance path from Chepstow on the Severn Estuary to Prestatyn on the coast in north east Wales and view most of the earthworks. The dyke around Panpunton hill may not be the best preserved or most dramatic, but take into account how high and remote we were and you start to understand the achievement of the construction team. English Heritage own 3 miles of dyke in the Wye valley just north of Chepstow. This section also gives great views of Tintern Abbey and surrounding landscape. The Hawthorn hill section south of Knighton is set in wild landscape that gives outstanding views across the Welsh hills. Probably the best preserved and most continuous section can be viewed between Llanfair Hill and Kerry Ridgeway in Shropshire. From the east of Montgomery the dyke can be seen weaving across the fields of the flat plains. And finally, from Chirk Castle the well preserved dyke can be viewed as it runs down into the stunning Ceiriog Valley. 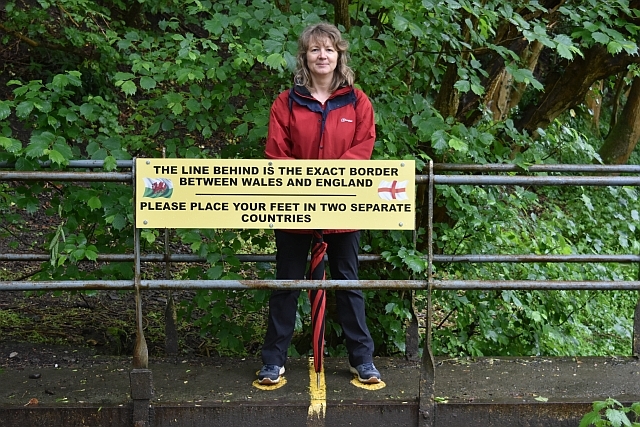 So put on some strong walking shoes, pack your sandwiches and get out and explore the dyke. You’ll be amazed… Oh, and don’t forget the rain jacket (just in case). 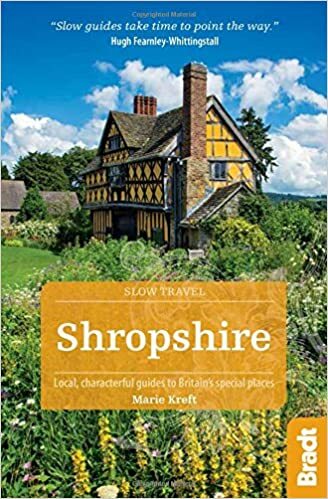 If you enjoyed reading about Offa's Dyke and would like more suggestions of what to do in Shropshire then please return to our Shropshire page here.